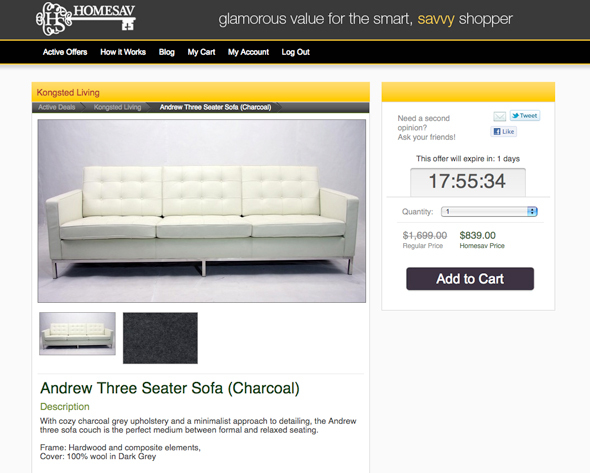 Homesav is the latest in a boom of new deal-a-day websites. But this time, their offerings are exclusively product-based, offering deep discounts (up to 70% off) on home dĂŠcor, furniture and accessories. The Toronto-based company entered the market with some good bargains, modern designs and a few growing pains. Does it have staying power? I took it for a test drive and I have my doubts. It seems like every time I log in to Facebook, the banners ads persuade me to sign up for yet another daily email coupon. I cave every time. Each morning I am greeted with messages from Living Social, Wagjag and Groupon - irresistible markdowns on teeth whitening appointments and zipline adventures and buffet dinners. On one hand, the savings - up to 90% off in some cases - are hard to turn down, but I remind myself that I wouldn't have spent the money in the first case, so I'm not actually saving. So far my credit card hasn't left my wallet. Now, for the purposes of this post (I swear) I am also a member of Homesav. On my initial attempt to join, I was met with an error message. Twice. Forgiven - the site just launched and glitches are expected. Third time's a charm. Navigating through the site, I find the process and information to be, for the most part, straightforward and user-friendly. The product selection is beautiful, as well. Many of the daily deals are available for 72 hours (rather than the usual 24), which is a good thing - a $1,000 sofa isn't exactly an impulse item. The site has its issues, however. I am skeptical about some of the suggested retail prices (the supposed pre-discount costs). 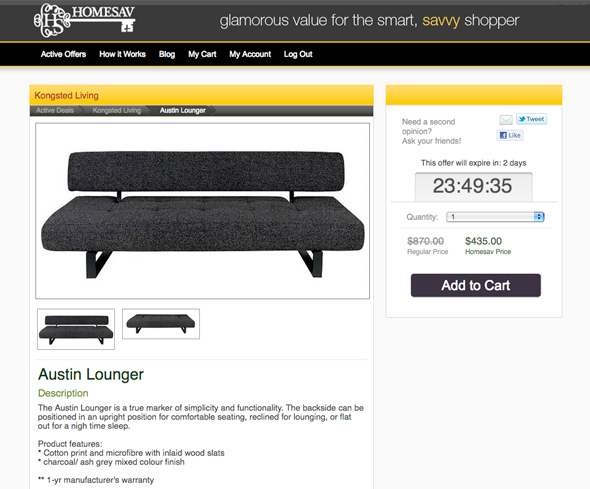 One particular couch - a Konstead Living Austin Lounger is listed as $870 at regular price and $435 at the "Homesav price". As I type, I am sitting on this identical couch. I purchased it two years ago for $500 (not on sale) at an independent futon shop in the Annex. Today's deal is a selection of Paddywax brand candles and diffusers. A set of two Eco Pomegranate & Currant soy candles is offered at a discounted price of $25. A Google search netted a few similar deals. 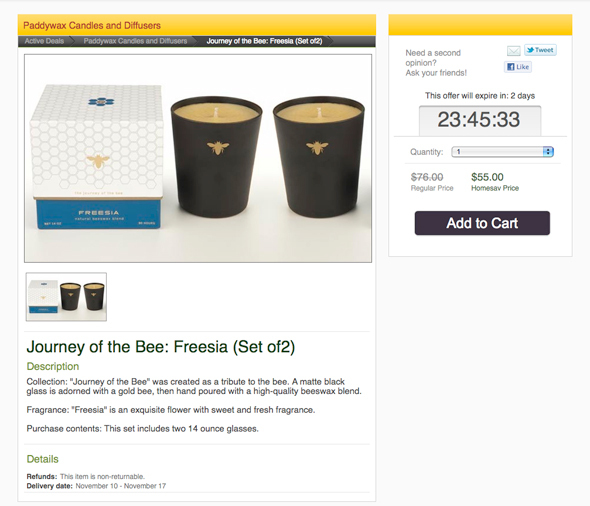 On Amazon.com, I could score the very same candles at $12 apiece and with comparable shipping. Another Kongsted couch is available at a huge discount - it's down 50% from its original $1600 price tag. It's gorgeous, and this time it seems like a steal. However the item is not pictured in the correct fabric. The images show a white leather version, plus a tiny swatch of the grey wool (the upholstery that I would actually be purchasing). Would someone really buy a non-refundable couch on the internet without even seeing an accurate photo? I can't imagine. While I love that shipping times and costs are transparent at the check-out step, several attempts to add and remove items from the cart resulted in wonky shipping calculations. Yesterday, a couch cost $11.95 to ship, and today the same couch carries a $27.80 ship cost (the third time, it was $62.20). A message on the cart page tells me shipping within Canada is a flat $11.95 for the first item, and $4.95 for additional (excluding furniture). I don't think the shipping is exorbitant, but it depends on the purchase. $12 to ship four cloth napkins, for example, is a tad steep. 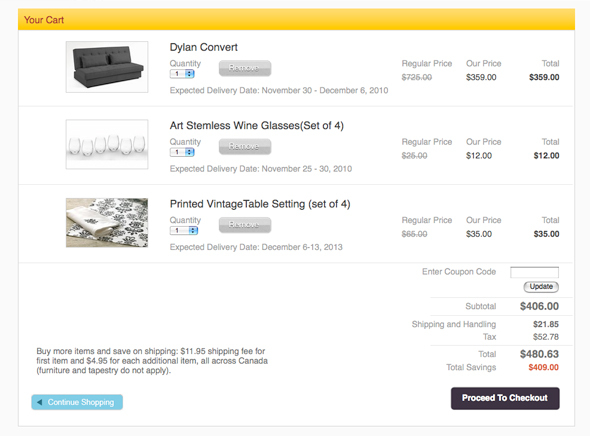 Whereas, $28 to ship a couch is amazing. Back to the drawing board on the shipping structure, please. Can Homesav survive in an IKEA world? I don't know. If I can already buy moderately-priced housewares online without making split decisions (sometimes I need more than 72 hours of hemming and hawing), I don't know if I see the value of Homesav. And, I am not entirely convinced that the offers are remarkable enough to compete (are they any better than Homesense?). But, it's a new company and it's Canadian, so I am open to keeping my subscription active for just a little while. I think there may be great deals to be had. My advice for now? Do a bit of Google homework before you buy.